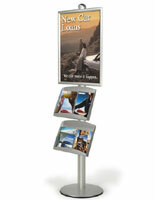 This silver combo poster and brochure display is a single-sided signage fixture that is ideal for use in public areas as a floor sign and takeaway literature holder. 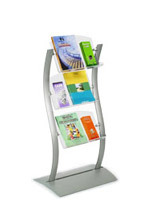 The stylish aluminum information rack features a 22" x 28" graphics frame that snaps open easily and includes a clear acrylic lens. 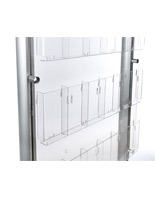 The combo poster and brochure display for office or commercial use also features a 4-pocket display tray for 4" x 9" trifolds or leaflets. 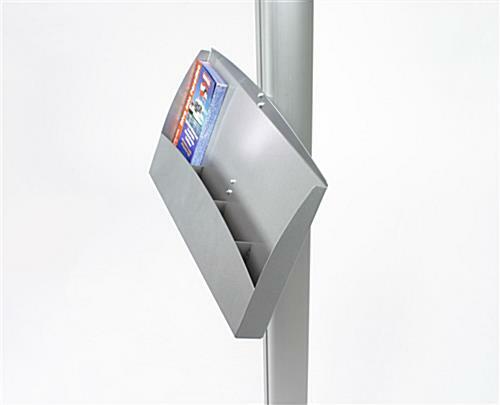 The dual signage design of this fixture is perfect for use as an information rack in high traffic locations. 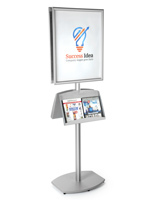 The poster and brochure display is ideal for attracting customers of passers by with high visibility graphics and allowing them to take away related literature. 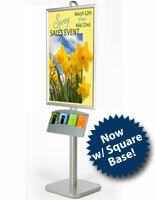 This type of office or lobby signage is a sturdy, freestanding alternative to wall mounted fixtures. 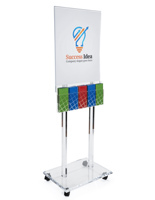 32.0" x 75.0" x 17.5"